AVG UTICOR Programmable Message Displays (PMDs), are found in numerous applications throughout all industries. PMDs are extremely versatile products, enabling your PLC or control system to display vital production status or alarm messages to plant-floor personnel in real time. Character-Based Master Message Displays store several (memory dependent) messages. These messages and their characteristics (such as blinking, centering, scrolling, etc.) are programmed using a programming software that runs on a PC (available free from AVG UTICOR). 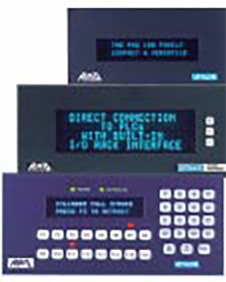 A Master Message Display continuously polls the connected PLC for a message number and several control parameters. Based on the control parameters, the Master Message Display can display the message, send the message to one or a group of Slave Message Displays or Marquee Displays (described below). A PC can also control the Master Message Display. A Message Controller is functionally the same product as the corresponding Master Message Display, except it has no display of its own. 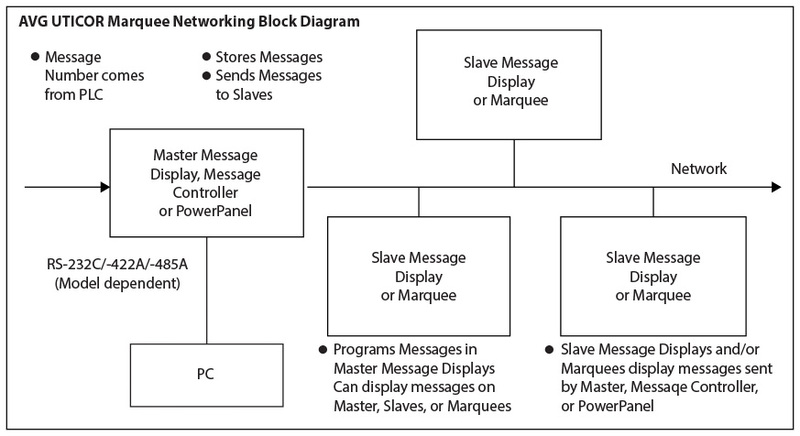 Thus, a Message Controller, like a Master Message Display, stores messages and sends these messages to Slave Message Displays or Marquees (to one, group, or broadcast), based on PLC and/or PC command. Slave Message Displays do not store messages. They are typically used with a Master Message Display, Message Controller, or a PowerPanel. Any of these units can drive a network of several Slave Displays. Each Slave Display used on a network has a unique address. This addressing scheme allows a message to be sent to one, several, or all slaves on the network. PMDs offers a wide variety of features. A list of features follows. Please refer to data sheets of each model for more information on a model. record of events in the unit. Messages sent to a printer or Marquee, but not to the Master Message Display’s own display. uploaded to the Master Message Display unit. The computer does not need to be connected to the unit for this programming process. Master Message Display unit is programmed directly from the computer. The unit must be connected to the programming computer. With on-line programming, the user can develop screens while the display unit is running. This allows modification of the screens without having to take the unit off line. A clock that indicates the passage of actual time. Scrolling Message A message that contains up to 235 characters and moves from the bottom of the display to the top, or from the right of the display to the left.